You see what I did there? I do love a good food pun – especially when it’s describing good food! 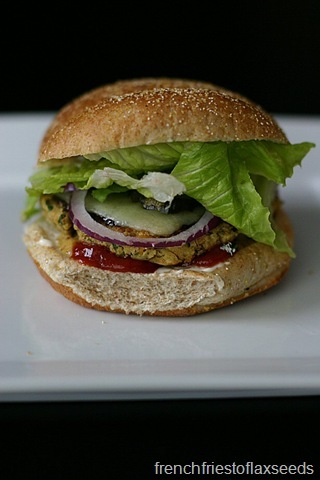 One of my culinary missions in life is to come up with a signature veggie burger recipe. I feel like I’ve become a connoisseur of veggie burgers – I often order them when I go out and am craving a burger but don’t want meat, and I see that it is a house made burger on the menu, not one of those store bought pucks. Not just because I like veggie burgers, but because I’m still looking for the perfect combination of flavours and textures. I’ve had some really good ones, and I’ve got some ideas about what I would put in my ultimate burger. But I’m not there yet. I know what you’re thinking – Marianne, why are you even writing this post then? 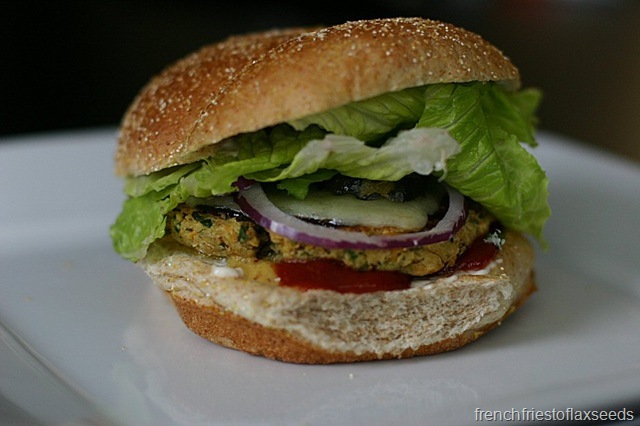 Well, I want to share with you my current go-to, super easy veggie burger. Because not only is it simple for even the busiest nights of the week, my boyfriend also requests it frequently on the menu plan. Did I mention he proclaims he doesn’t like chickpeas? Proof this is one damn good burger. I had the idea to make falafel one day, and started browsing recipes online. I came across one for a falafel burger, which sounded like an excellent idea. I took the basic recipe, then used my pantry and skills to come up with what has been a burger we have made probably 10 or more times in the past few months. Once my boyfriend said it kind of tasted like a chicken burger. I don’t know what I agree, but the way it looks could fool some people. It is very versatile too. Switch up the spices based on your likes or what you have in the pantry. Use different beans if you want. Dress it up like a traditional burger, with ketchup, mayo, cheese, and pickles. Or go the falafel route and use tzatziki and tahini sauce. Heck, add bacon if that’s how you roll – I won’t tell anyone. This easy peasy veggie burger comes together in a snap with a few pantry ingredients – perfect for getting the kids cooking. Great for vegans, vegetarians, and meat eaters alike! Dress it up like you would any other burger, or throw it in a pita with some tzatziki and cucumber. 1. In a large bowl, mash the chickpeas with a potato masher until just a little lumpy – you want some texture. 2. Add in garlic, parsley, onion, flour, olive oil, cumin, and cayenne. Mix until well combined. Season to taste with salt and pepper. 3. Divide the mixture into 4 equal balls, and form into patties. Allow to rest 5-10 minutes. 4. Heat a large skillet over medium heat. Add a bit of oil if non-stick. 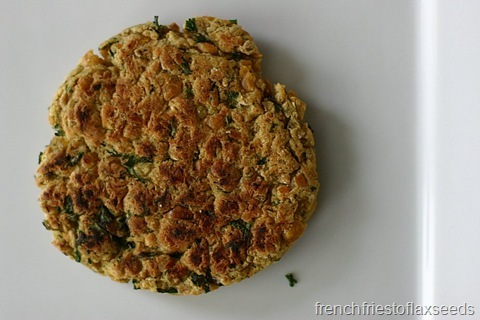 Fry the patties until golden brown and cooked through – about 5 minutes on each side. 5. 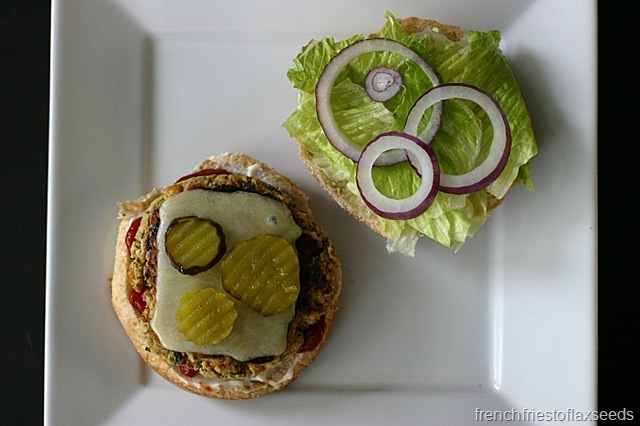 Serve with your favourite burger toppings or as you would falafel. Notes: You could use a food processor to mix all of the ingredients, but you probably won’t get the same texture. Feel free to switch out the fresh herbs for whatever you have on hand – sometimes I like to add dill or basil. 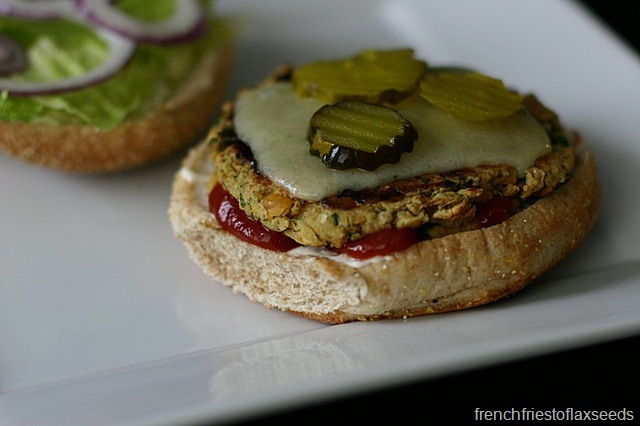 Do you have an awesome veggie burger recipe? Share the recipe in the comments! Great job with the title and the recipe!